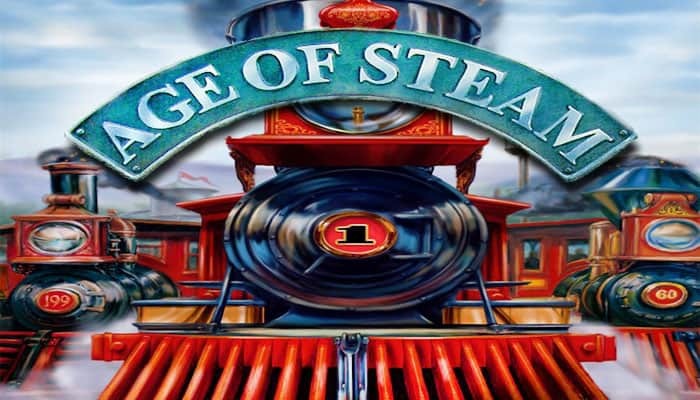 Steam-belching iron horses roar across the wild plains! Age of Steam relives the era when pioneering U.S. railroads built the tracks that transformed America's economy. The cut-throat action is centered on the industrial powerhouses of the growing nation: Pittsburgh, Cincinnati, Chicago, and beyond. Can you finance both the most extensive track network and the most powerful locomotives? Which routes will give the best returns on their costs? Can you beat the opposition to the most lucrative shipments? Will you make enough money to pay your aggressive creditors? Competition is brutal, with the game usually going to the player who plans most carefully. Each self-contained phase in the game keeps players constantly involved in making vital decisions and interacting with other players. Age of Steam also allows towns to be developed into cities, ensuring that no two games are exactly the same.